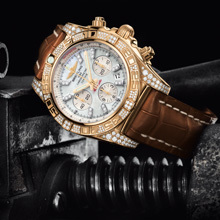 Launched in spring 2009, the Chronomat houses Caliber 01, a high-performance selfwinding chronograph movement entirely developed and produced in the Breitling workshops. A perfect blend of power and elegance, it has rapidly asserted itself as the new benchmark in the fi eld of mechanical chronographs, indeed as the ultimate chronograph. 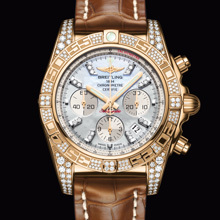 Breitling now introduces this stellar model in precious new 18-carat white and rose gold versions. To emphasize the strong, unique and essential design of the Chronomat 01, while preserving its readability and its functionality, the brand has designed a highly original diamond-set motif. The unidirectional rotating bezel is still graced with the exclusive engraved numerals, but the latter alternate with brilliants arranged in three rows and cambered hourmarkers accentuated by four slightly larger diamonds. The result is a dynamic composition with a vibrant, upbeat tempo. 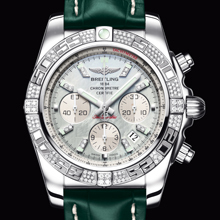 The hour-markers on the mother-of-pearl dial are graced with double diamonds. The Chronomat 01 jewelry model is also available in a second version in which the adornment of the bezel and dial is complemented by diamond-set lugs. Distinctive design, an exceptional movement, sparkling stones, the warm glow of rose gold or the discreet refi nement of white gold… Each of these creations, crafted by the most talented jewelry artisans, embodies the perfect blend of luxury and performances that is bound to appeal to devotees of fi ne timepieces destined for great accomplishments.